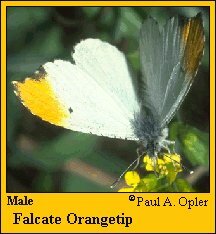 Identification: Upperside of male forewing with orange, hooked tip; females hooked, but lack orange; both have round black spot in cell. Underside of hindwing has finely-patterned green marbling. Life history: Males patrol for females. Only one egg is laid per host plant, singly on a flower stalk. Caterpillars feed on buds, flowers, and seed pods. Chrysalids hibernate. Caterpillar hosts: Plants of the mustard (Brassicaceae) family including rock cress (Arabis) and winter cress (Barbarea) species. Adult food: Flower nectar including flowers of mustards, violets, and others. Habitat: Open, wet woods along waterways, open swamps, occasionally dry woods and ridgetops. Range: Southern New England southwest to south Texas, north to eastern Oklahoma and Kansas. Local populations or strays to Florida panhandle, eastern Nebraska, and southern Wisconsin.